The N64 was, for the time, a formidable piece of kit. Its chipset was developed in conjunction with Silicon Graphics and provided the console with power that put rivals like the Sega Saturn and Sony PlayStation in the shade. 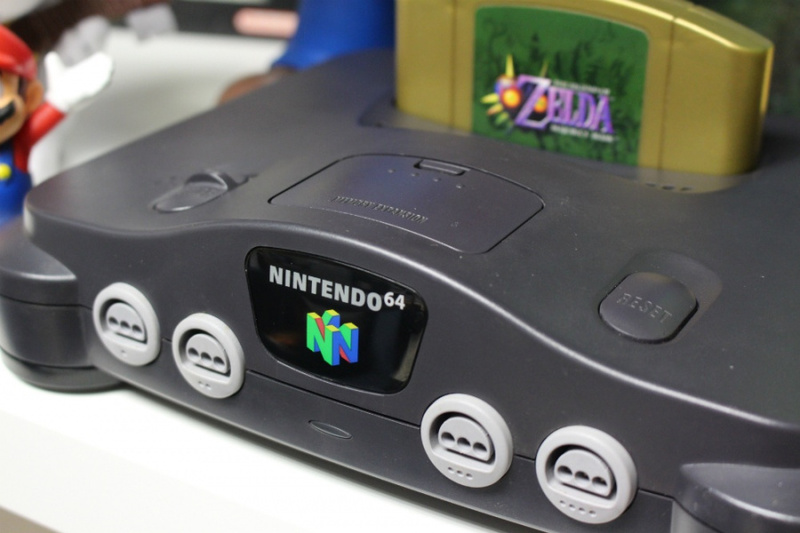 However, the complex nature of the chips involved resulted in a significant delay and the N64 arrived on the market after both of its competitors. I got to travel to SGI in Mountain View to write test code that would run on some of the few 'golden chips' - this is the terminology for the first chips which come off the production line. From the initial run there were very few working chips, and SGI kept them in-house, so a few developers would fly out to use them for a week. I think I might have been the only 'worker' from Rare, although Chris Stamper travelled. I wrote a piece of code which displayed spinning icosahedrons; as many as possible until the framerate dropped below 60Hz. The head of the project at SGI was not too pleased to discover what the performance of the machine was in terms of triangles per second. He asked to see my code in the hope it was inefficient. It wasn't. He later told me that SGI very nearly did another spin of the hardware to fix the issue, which was with the memory interface. I don't know exact figures but a second spin of the hardware (equivalent to a second edition of a book) is sometimes said to cost a million dollars, and there is the additional cost of a delay in reaching the market which might be enormously larger. Today I can't tell you if the Nintendo 64 could have been faster. From my perspective it was an extremely fast machine and without the many visual artefacts that made the Ridge Racer coin-op or PlayStation a little distracting. Hollis' talent didn't go unnoticed - upon leaving Rare in 1998 he joined Nintendo of America as a consultant, working on the GameCube. He returned to the UK to establish Bonsai Barber studio Zoonami in 2000, and is currently working on experimental games. I loved my N64 - it was probably the best local multiplayer machine I've ever had. But this makes me wonder how much better Goldeneye and Perfect Dark would've been if the system had gone for a revision. @foodmetaphors Aw that's okay, we have Super Hexagon now. That game'll give you all the spinning triangles you could possibly want. A really cool piece with Martin Hollis - I often find it interesting when reading about hardware coming together. Hollis is a veteran I truly respect. I remember him speaking about his first game: a section of code that was printed in a games magazine so other people could copy it on their own systems (if I recall correctly it was for the C64). What a ledge! N64 3D polygons always appeared solid, like they had some weight to them. PS1, though I preferred it's clearer resolution, 3D polygons appeared paper thin and had that weird warping effect when they got too close to the foreground. It makes metal gear solid all the more impressive because it seemed to avoid all of the distracting PS1 glitches somehow, even the crude pixelization..
A good opportunity, while we are here waiting for more NX news, to remind everyone that the creation of a new piece of hardware is an extremely complex and tedious task. I always wondered why the N64 was a little late to market. I'm quite amazed at the work that goes into these machines. It would have been nice to hear what that triangles per second figure actually was in this test. Maybe "Perfect Dark" wouldn't have been such a slide-show in hi-res mode. @foodmetaphors It's been delayed 20 years but I'm still hopeful for a release! It was already delayed a year (nearly 2 years for Europeans), they couldn't have waited any longer, and by the time it rolled out worldwide it was already beginning to look dated. Man I miss the days when Nintendo made good consoles. Even with a miss step like this their hardware was still top-notch or at least close to the top. All they had to do was fix their physical copy mediums, improve their 3rd party relationships, and add multimedia capabilities and they could've had one of the top consoles today. They could've been the ones competing with Sony instead of Microsoft. Instead they went the gimmick route which gave them success once, but turned their situation to crap after. Wii was insanely successful but there was so much wrong with its existence and the repercussions of the Wii generation continue to haunt Nintendo today. Sometimes it feels like the only competitor Nintendo ever WANTED was Sega and now that they're gone they feel empty and lost. @Blastcorp64 The issue was that apart from Anti Aliasing the N64 hardware was designed to run basically two blur passes over the image. The N64 HDMI mod actually undoes the blur passes leaving the 320x240 or 640x480 outputs alone if you are lucky enough to see it in person the difference is immense on a HDTV. As for Metal Gear, having the camera stationed from a birdseye view far from the action was an intelligent design decision as it helped alleviate the harsh blocky texturing, polygonal warping and juddering typical of PS1 games. I still have my old systems hooked up, despite the blur filters the best N64 games look next gen compared to PS1. It's just unfortunate that due to the large numbers of rampant PlayStation fanboys on the internet there is far to much misinformation being spread about N64. On many instances people refer to the PS1 as running all games at 60fps despite most of them, including MGS running no more than 25fps! @Kirk I remember hearing rumours of 600,000 polygons per second without all the advanced N64 'only' features in the 90s, but apparently without the memory interface issue it should be hitting 1,000,000. Still I remember older Rare interviews that said SGIs microcode was basically rubbish allowing access to less than 60% of its power, add in apparently many of the devkit features were broken. I think it was Hollis and Eggbrecht from F5 who also said the only way to make use of the systems potential was through writing custom microcode. That would explain the massive draw distances, up to 15 enemies on screen, dynamic lighting and 640x480 at a smooth 30FPS in Battle for Naboo. No wonder only the most talented teams could get the most out of it. @liveswired Ah, cool. Cheers. I actually though the N64 was capable of far less polygons than that to be honest. @Kirk Apparently with all effects, AI etc with custom microcode it could handle well in excess of 120,000+. SGI microcode code with everything on was around 100,000. There was an interview with Julian Eggbrecht in one of the GCN magazines in the run up to their Rogue Squadron Rebel Strike III around 2003/04 were he discussed writing custom microcode for the N64. He also stated they chose N64 as the PS1 could not run their engine due to lack of processing power. He also stated had Rare taken what they learnt from GoldenEye 007 and wrote a new graphics engine from scratch instead of bolting onto GE engine, Perfect Dark could have featured 2x the graphics in high resolution with a smooth frame rate. Indiana Jones was another N64 game by F5 which only made it to US rental in 2001, the graphics in the N64 version, running at 640x480 were actually more detailed than the PC edition, including environments and textures with a host of partical and lighting effects added in! It's pity that a team as talented as Factor 5 weren't snapped up by Nintendo. They had big input into GameCube but the friendship eventually fizzled. @liveswired Yeah, Nintendo's dropped the ball with snapping up a few great developers over the years. One of the first games I ever played on the original PlayStation was Tomb Raider, and I just could not get over the fact about how all the walls look like they were shaking and shuddering. @liveswired Wow, there is a HDMI mod for the 64? The blur effect had its purpose, but sometimes I felt it was overused. I understood why they would use it on flat sprites, but I didn't feel it was necessary to make, like a brown mountain, made from polygons, blurry. @Danrenfroe2016 Lol, Tomb Raider was the exact game I was thinking about. the last stage on Burning Rangers for the Saturn is pretty rough. It appears like it's incomplete or something or, the developer ran out of time. @Blastcorp64 I just looked it up, that was very interesting reading, I remember it like it was yesterday how bad it looks, it's also kind of interesting I just recently bought a Dreamcast and one of the games on it is a Tomb Raider game, and I remember thinking wow it does not Shake around like crazy. But I still don't understand Tomb Raider, and how anyone can play it for more than a few minutes, the controls are so so bad, it's like I do not understand why they made the controls so damn complicated when Mario 64, you can just bounce around all over the place with no trouble whatsoever. @Blastcorp64 The ideas were perhaps too forward thinking for their time, combined with Nintendo's inexcusable decision to cut RGB certainly hasn't helped in the digital era. @foodmetaphors Have you tried kickstarter? Lol. @Blastcorp64 Yeah, totally agree. I felt the N64 moved polygons with more "authority" than PS1 or Saturn. I don't really know how else to describe it.